Winding cobblestone streets, the Sorbonne, the dome of the Pantheon… this is the historic 5th Arrondissement, one of the oldest and most delightful neighborhoods in Paris. Known as the Latin Quarter, today many famous attractions are found here — from the Pantheon to the Cluny Museum, from the markets on Rue Mouffetard to the zoo at Jardin des Plantes. It's the neighborhood where you'll find some of our top recommended hotels in the city — all of them with great travelers reviews, close proximity to the Metro and Paris attractions, and full of charm. What else would you expect from the Latin Quarter? 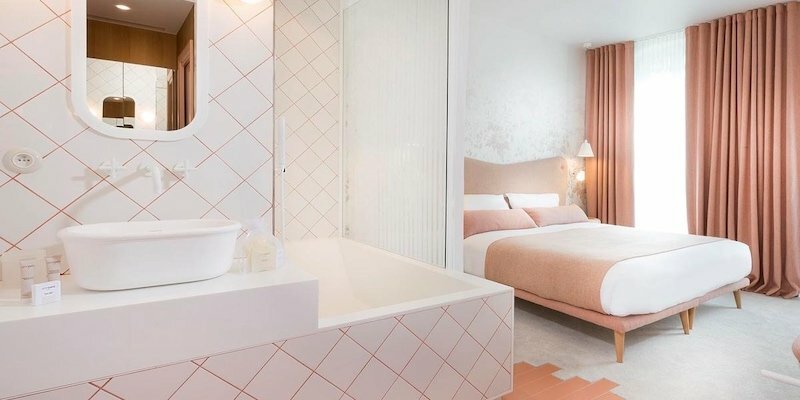 The newest entry to our Latin Quarter hotel list, Hotel le Lapin Blanc has a clean, fresh, modern vibe. Done in white, perky pastel color accents, and wallpaper, the decor is apparently inspired by Alice in Wonderland — but in a good way! (Lapin Blanc means White Rabbit.) Travelers love the atmosphere, the design, and the helpful staff. As if that wasn't enough, the location is perfect, at the middle of a triangle described by the Pantheon, Jardin du Luxembourg, and Île de la Cité. Notre Dame is a 14-minute walk, Saint-Germain is 12. 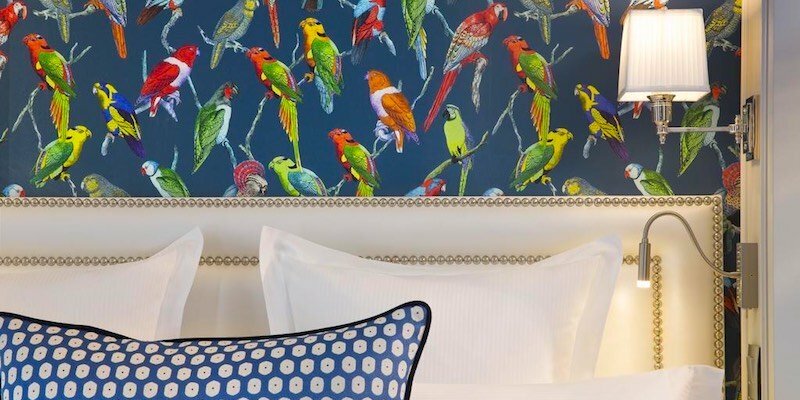 I travel to Paris a lot for work and Le Lapin Blanc is definitely my favourite hotel. Location is fantastic. Not overly crowded with tourists and its only a few steps away from both bus and metro station. Many great restaurants and coffee shops around. Super cozy and beautifully designed room, tasteful amenities and very clean. I love the thoughtful details in the interior like great lighting and efficient storages that makes the stay very comfortable." To us, the reigning top hotel in the Latin Quarter is Hotel Monge, on the street of the same name. As soon as it opened Hotel Monge knocked all the other area hotels down in our rankings. 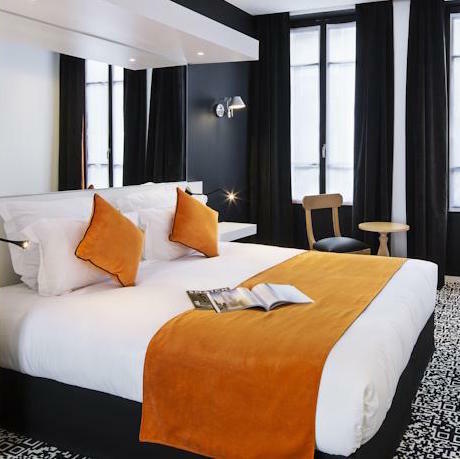 Perfectly located in a vibrant neighborhood Hotel Monge is also convenient to the things you want to see in Paris, like the Pantheon and Notre Dame. There are also two Metro lines to choose from (7 and 10) that get you to the rest of the city quickly. Everything about the Hotel Monge is excellent — the best hotel beds and pillows ever, fantastic lighting design, great staff and service. Since we started singing its charms, Hotel Monge has become incredibly busy, so be sure to book early. This is an amazing, near-perfect place to stay in the quartier. Hotel Monge sits majestically on the street that bears its name. We love the cosy lounge where guests can relax with un journal (newspaper), un cafe, ou une coupe de champagne. There are only 30 rooms, each is beautifully decorated, well designed, and very well equipped. The room lighting design is superb. All rooms are soundproofed and feature what we think are the most comfortable beds in all of Paris." 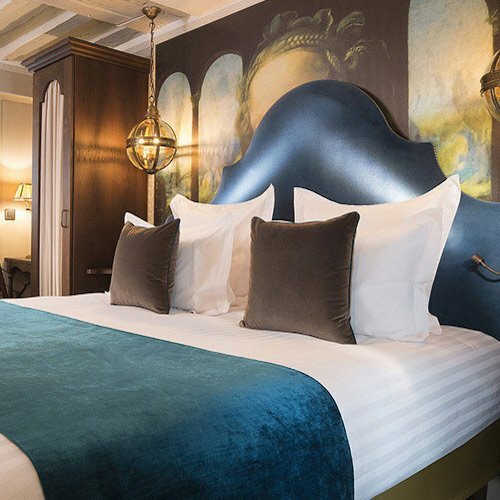 From the high-comfort design group, Esprit de France, comes this renovated 4-star hotel perfectly situated in the Latin Quarter in close walking distance to Notre Dame, the Cluny Museum, and Saint-Germain-des-Prés. 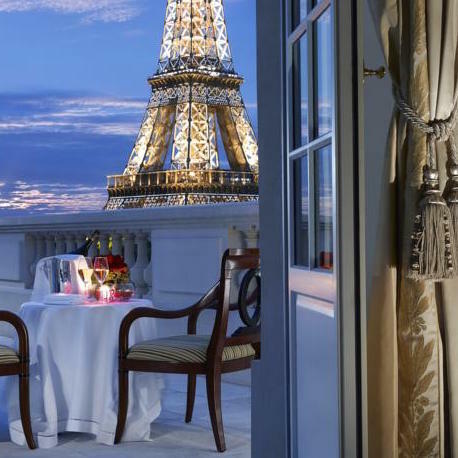 Many of the rooms have terraces with spectacular views across Paris. Despite being in the center of things Parisien, Parc Saint Severin is located on a a quiet pedestrian street. We like the Terrace Room with the view over the top of Église Saint-Séverin to Notre Dame just beyond. The entire setting was cozy and homey, which made our time to be very pleasant. The staff was courteous and extremely helpful. 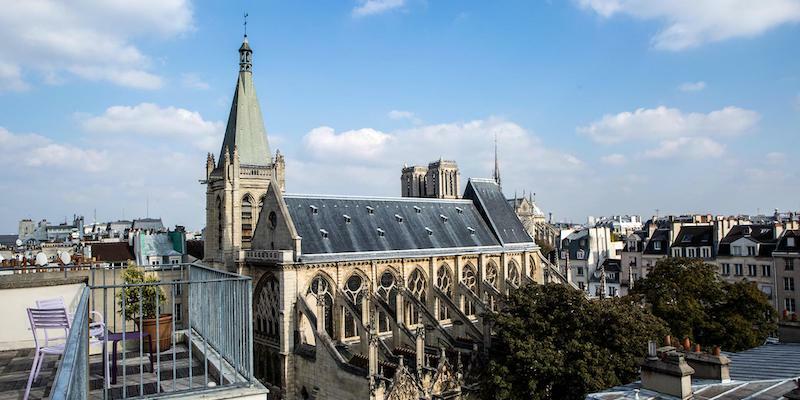 The residence is well located, in walking distance to Notre-Dame, Ile de la Cite, the Pantheon, Luxembourg, Cluny museum, and many good restaurants." Crossing the Seine on the city's oldest bridge (called, oddly enough, Pont Neuf or "New Bridge"), it's a 10-minute leisurely stroll to the Louvre Museum. On the way you'll pass the triangular jewel of a park, Place Dauphine. Want to stop in at Notre Dame? No problem, it's just beyond the place. 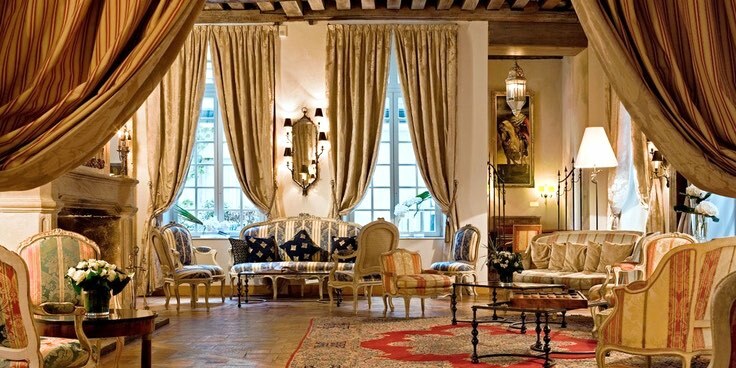 D'Aubusson was originally a 17th-century mansion and has been refurbished to luxurious standards. Some rooms overlook the courtyard, and those are our favorites. Our Rating — Superb-Plus ! Fantastic hotel — every little detail was well thought about. Great staff, knowledgeable and helpful. Location — easy easy access to all main attractions, but in the heart of a great cafe and restaurant area. Would recommend this hotel over and over again… Interior of the hotel is truly beautiful, pictures don't really do it justice." "Residence" is a class of hotels that offer larger suites and apartments and the Henri IV is a highly-rated example of this. We choose a residence when we're looking for more space, particularly during a longer stay. Henri IV is a classic French hotel, with a decor that reflect the history and charm of the quartier. It's located in pretty much the geographical center of the Latin Quarter. We like the large Suite Prestige. We also like that it's named for our favorite French monarch, Good King Henry. 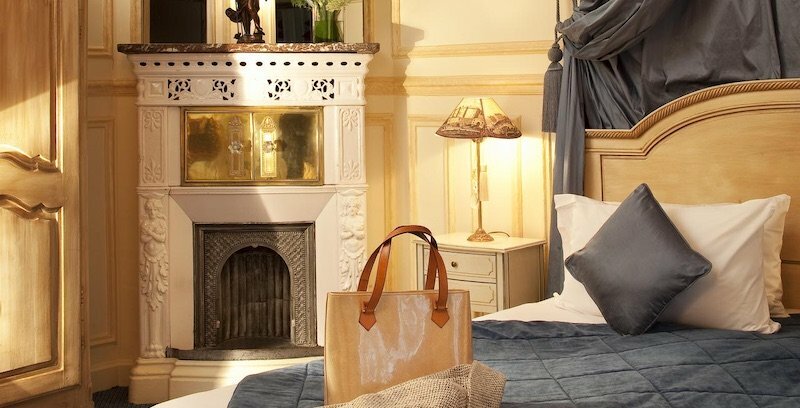 Let's head over to the Place du Pantheon and another charming hotel in the heart of the 5th Arrondissement. 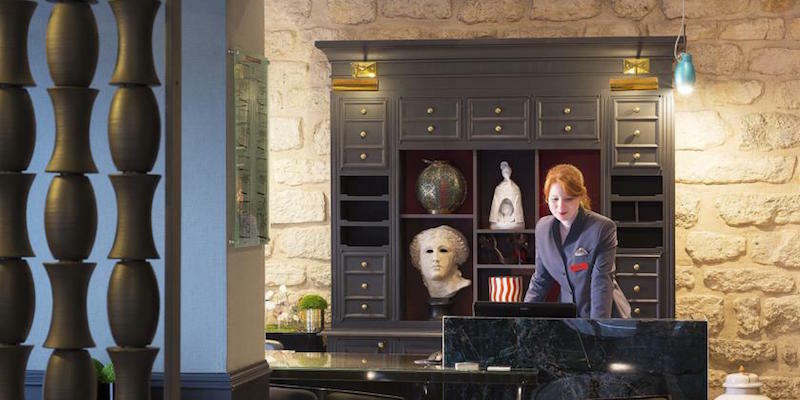 The Hotel Les Dames du Pantheon, named in honor of the two women who are laid to rest in the Pantheon (and also as a play on Hotel des Grand Hommes), is set in a 17th-century building just across from the Pantheon itself and five minutes away from the Luxembourg Gardens. We love the mix of antique furniture, fresh fabrics, period woodwork, and exposed beams, as well as the recent upgrade. 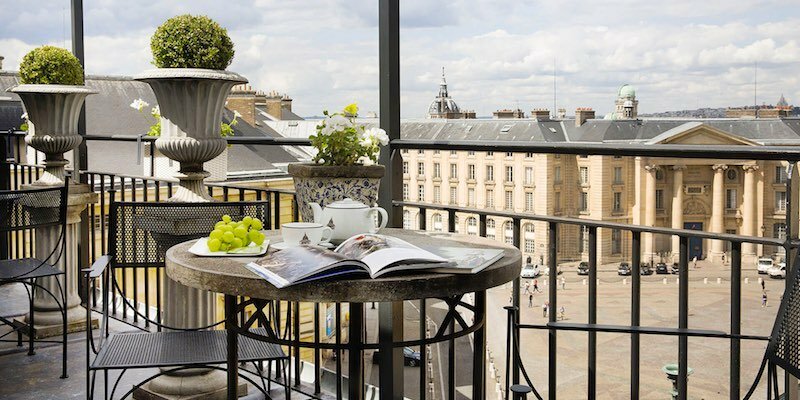 And, if you book a superior room, you'll be rewarded with an amazing view of the Pantheon and be able to see across the rooftops to Sacre-Coeur, on the other side of Paris. All rooms have air conditioning. Lovely hotel, romantic, with a boutique feel. Great Location. The deluxe room with the view of the Pantheon was wonderful, plush decoration, very opulent and romantic. Great location, a short walk to everything. Found a fab eatery just around the corner… staff friendly. Can't fault." You won't go wrong with this classic Latin Quarter hotel. First of all, the location is fantastic — right in front of the Pantheon on the place. In fact, the hotel is named after the famous French men (and two women) who are buried in this monument. 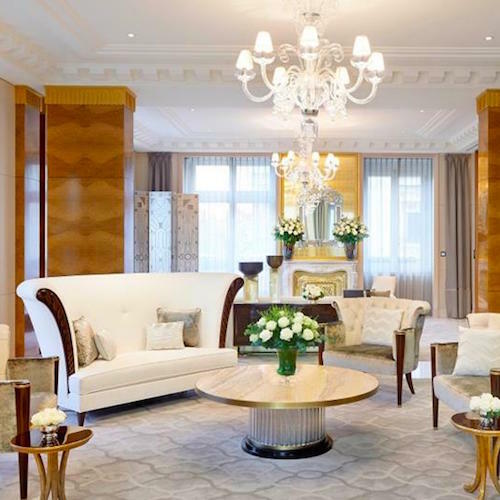 Travelers can't seem to get enough of this winning Paris hotel, and for good reason. It's close to so many must-visit places — Jardin du Luxembourg is just down the hill, Rue Mouffetard (the market street) is just around the corner, and the famous English-language bookstore, Shakespeare and Company, is only nine minutes away on foot. Great hotel, great location… Excellent and very friendly staff…helpful and accommodating. Staff gave me an free upgrade to a suite and it was elegant and very clean. Bathroom was huge, especially by Paris standards. Clawfoot tub, lots of closet space. Location is fabulous. Would definitely stay there again."